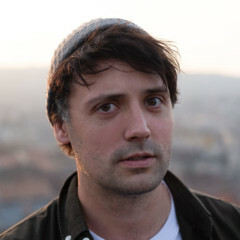 Simon is a writer-director from London. His work is wryly comedic and gently political with a unique blend of the domestic and the fantastical. Simon’s recent short film, CONTRACTOR 014352, starring Johnny Flynn and Daniel Ings premiered at Palm Springs Shortfest before going on to win Best European Film at Brest Film Festival, Best Screenplay at the Lift-Off Global Awards and winning Grand Jury Prize at Kinematic Shorts in Russia. It’s since sold to Canal+ for international broadcast and Air Canada’s in-flight entertainment. His first short film, THE ELEVATOR PITCH, was a finalist of Sundance London, saw him nominated for IMDB’s Best New Filmmaker, and received a Vimeo Staff Pick following its online release. Simon is a visiting lecturer at the Royal College of Art and has devised and directed several site-specific live productions which use new technologies. He is currently developing several original projects for television and film.